Have you ever heard the term, “You get what you pay for”? It usually means that you pay cheap, so you get a cheap service or product in return. And customer service? Forget about it. The phrase comes with the implication that you shouldn't just lower your expectations, you should discard them completely. It’s an unfortunate fact that budget services and products cut customer service. The prevailing idea is that to have a “competitive” budget option while also providing a good customer service experience is not sustainable. That's where Dollar Shave Club proved many wrong. He describes dealing with a common problem, a broken razor. He notes that the response to his concern was “easy” and “fast.” The same as when he signed up to be a member. “They didn’t make excuses or make it hard on me,” Hyken relates. “They just took great care of me. That’s what great customer-focused companies do!” he adds. Dollar Shave Club was successful on its own despite being relatively small, and its disruption in the market did not go unnoticed, with giant corporation Unilever cashing out the company for a cool $1 billion in 2016. I’m one of those guys who’d look like a poor excuse for a kung-fu master if I decided to grow my beard out. Despite that, I do take shaving seriously. It was masterful of Dollar Shave Club to present an option besides the ones given by mainstream brands — whose best blades cost as much as a dinner at an expensive restaurant — and in a witty package no less. Their now-viral promo video was a clever mix of wit and beauty. Marketing-wise, it was an attention grabber, and easily stood out from its competitors. And that was the rub. Well, the first anyway. The video spoke to customers. It seemed to express some earnestness customers never experienced with bigger brands. It was funny and seemed like a fun experiment. It was differentiating itself not just with better, more competitive pricing, but through the creation of a unique customer experience. And it all seems so easy. A Medium article by Nikhil Basu Trivedi describes it well. 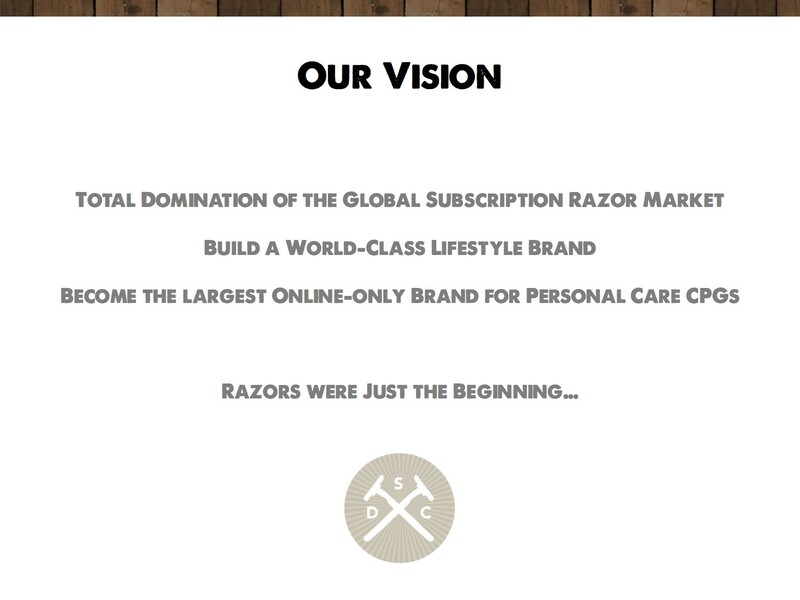 “Dollar Shave Club made the online experience of subscribing to razors both simple and fun.” Looking at the website and catalogs online, it DOES seem fun. The text contains the same wit and humor found in their viral video. Plus, I’ve also experienced the frustration of waiting for an attendant to open the razor cabinet at the grocery store. I’ve always asked myself what was so important or expensive about the razors that they needed to be locked up. I still ask that question. But Dollar Shave Club’s “build your own starter set” offers an experience at the other end of the spectrum. It considerately recommends products I also feel I need — mens’ shampoo and conditioner, a good toothbrush and toothpaste. Stuff I use and consume and replace regularly. Outside of the products they offer, the whole scheduling system looks simple but was pretty clever of them. By working under what best-selling author Joe Pine calls the "time well saved" model, the company took something mundane and made it into what the Dollar Shave Club is today. Once you look at the small but impactful changes the company implemented, it's easy to see how it became a disruptor in their industry. The more mainstream brands are still largely doing and showing the same things they've been doing for over 100 years. And although some now offer a similar subscription service or similar product branding, it feels like a token gesture; something pitched once Dollar Shave Club started taking over market share, and grudgingly approved by folks who still couldn’t understand why some little start up was doing so well. Another thing the company does well is engaging with current and potential customers. It’s not only pretty active on social media, they also keep the whole cool, witty vibe that made it famous. Dollar Shave Club doesn't have to be perfect, because it's customers' aren't. What they offer is simple: Good overall value. The value proposition for Dollar Shave Club is not just the price point an cool high quality product, but more so the whole customer experience it provides. What more could a guy ask for, really? I’m hard-pressed (really, I looked) to find something genuinely bad about the brand. Frankly, there isn't. Now, I’m off to build my own Starter Set at Dollar Shave Club, where I can be confident that they'll live up to their tag line: "Getting more than what you pay for."